ICICI bank is one of the leading banks in the Indian private banking sector. It is well known for its excellent and active approach towards the customers. ICICI Bank gives the best efforts to keep its banking facilities updated with the latest trends. If you have an account with ICICI Bank, you certainly must be enjoying the facilities. Are you aware of the different methods of making balance enquiry? You receive an SMS after making a transaction which clearly states the available balance in your account. You may also visit the ATM and use your Debit card to check the available balance. Updating the passbook or checking the available balance in the bank statement, are other methods of checking the balance. Accessing internet banking service is the advanced way of making the balance enquiry. But all these methods have certain limitations and restrictions. You may not access any of these services anytime and from anywhere. 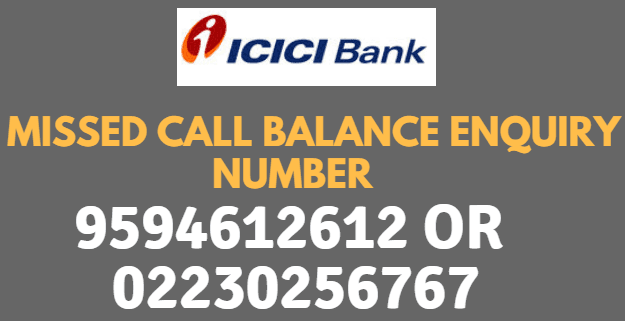 Are you aware of the missed call services introduced by ICICI bank? Accessing this service, you can easily make balance inquiry anytime and anywhere. You need to follow the simple step-by-step process. Dial 9594612612 or 022-30256767 from your mobile number. After 2-3 rings, the call will get disconnected automatically, if not, you can disconnect the call. Within few minutes you will receive an SMS stating the available balance in your account. Similarly, you can give missed call to 9594613613 or 022-30256868 from registered mobile number to get the mini statement (last 3 transactions) via SMS. It is a toll-free number, so, the bank will not charge you any fees, and even the telecom operator won't charge you a single penny. Customers can access the missed call service round the clock and from anywhere. Important note: This missed call service is only active for account holders with a registered mobile number, so, make sure to dial the toll free number from your registered mobile number. yes, 9572274241 is wrong to balance enquiry Number.